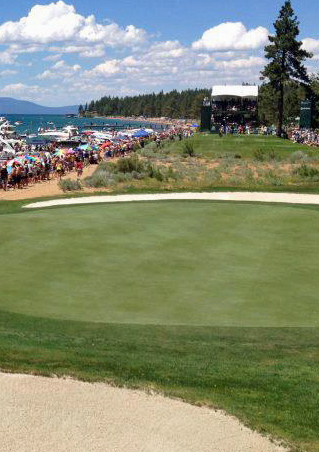 The beautiful Edgewood Resort in Stateline, Nevada is hosting the 24th annual American Century Championship. Celebrities have been hitting the links for 3 days now for practice and celebrity-amateur tournaments. Friday, July 19 is the first of two celebrity rounds of tournament play for the finals on Sunday. The NBC Sports Network will broadcast the event live on Friday, Saturday and Sunday. The list of sports and entertainment stars is extensive. There will be several sports stars from the NFL, NBA, and MLB. Others stars include Michael Phelps from swimming and Michael Waltrip/Denny Hamlin from NASCAR. Entertainers include Bill Engvall, Kevin Nealon, and Larry the Cable Guy. Notable sports stars Tony Romo and Michael Jordan will not be attending this year. Tickets are available at the venue, on-line and a most Raley's, Belair, and Nob HIl stores throughout California and Nevada. The admission price is $25 on Friday, Saturday, and Sunday. Only "point and shoot" cameras will be allowed.